Udforsk den smukke sydlige indiske delstat Kerala med denne seks-dages tur. 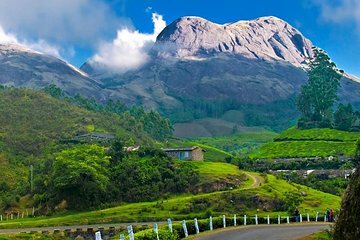 Højdepunkter omfatter besøg på historiske steder i og omkring Fort Kochin, den frodige teplantageby Munnar og de vildt jungle Thekkady, der er hjemsted for Periyar Wildlife Sanctuary. Du kommer også til at krydse backwatersne, se en traditionel dansepræstation, og hvis du ønsker det, skal du behandle dig i et ayurvedisk spa (egen regning). Vær opmærksom på, at eventuelle indgangsgebyr er på egen regning. The tour was an average experience for someone to experience Kerala. Mind you the hotels are not the best of hotels but they are nice enough. The herb and spice garden in Munnar was not really a garden. Its more like a small space of couple of trees of each species and then they have a shop for you where they kind of force you to buy products from them. So that felt like a scam to us. We were not offered the wild life sanctuary tour in Thekkady, telling us it was not included when it clearly says in our itinerary it was. But the houseboat experience in Alleppey was divine. The houseboat was beautiful and the experience was memorable. Overall it was a decent trip that could have been better organized. And you need to make sure you are really getting what you paid for in this trip, or I feel like they will try to take the easy way out with you.